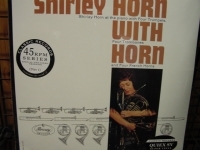 "Shirley Horn, With Horns - Four 180 Gram 45 Speed LPs"
Four 45 Speed 180 Gram LPs. This Long Out of Print 45 LP SET was mastered from the Original Session Tapes to 180 Gram Heavy Virgin Vinyl and is one of the Rarest Limited Edition Audiophile LP's in existence (only 500 ever pressed & one of the only copies left in the world). Don't miss Out. Each set has 4 LPs at 45 Speed, 180 Gram Vinyl on a 12" LP. Cannot be found at any retailer. These 45 LPs are so Rare that many of these Out of Print masterpieces sell for $200+ in these 180 Gram factory Sealed Limited 1st Edition/1st Generation Pressings. This 180 gram pressing is the only way to verify that a 1st edition Collectors find from Classic Records mastered on a high-definition Virgin Vinyl pressing for superior fidelity. The nicest thing you can do for your stylus and your ears. The ultimate record -- the way music was meant to be heard and of superior quality for any Audiophile. And of course cutting at 45 speed is the audiophile choice for the highes quality. A 45-RPM record is sonically superior to a 33 1/3 variety because of a 35 percent reduction of groove curvature compared to a 33 1/3 cut.. It means that while you can't fit as much music into a 45, the undukations of the groove that your cartridge has to track are stretched over a longer distance. For these reissues, the music was displaced onto four sides, meaning each side contains about 10 minutes of music. The only way you'll get closer to this classic music is to listen to the master tapes or have been in the studio with the artist originally during the actual session. You will be one of the last people in the world to own this 1st Edition Masterpiece. Track Listings 1. On the Street Where You Live 2. Great City 3. That Old Black Magic 4. Mack the Knife 5. Come Dance With Me 6. Let Me Love You 7. After You've Gone 8. Wouldn't It Be Loverly 9. Go Away Little Boy 10. I'm in the Mood for Love 11. Good Life 12. In the Wee Small Hours of the Morning And on a sade note, Shirley Horn passed away on October 20, 2005 at the age of 71 in her home-town of Washington, D.C.